post-hypnotic examines the resurgence of pronounced optical effects in the work of 28 painters living in the U.S., Switzerland, England, and Japan. The Op art movement—peaking in the wake of mid-sixties World’s Fair optimism—lost its critical appeal as it transmuted almost overnight from canvas into clothing design. 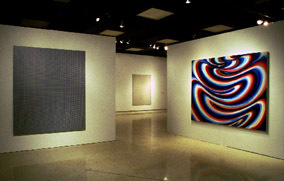 Since the 1980s, however, numerous artists have revisited perceptual phenomena involving pulsating patterns, afterimages, vibrating illusionistic space, and other sensations often associated with altered states. While philosophers, computer scientists and neurologists grapple with the nature and location of consciousness, sixties counterculture’s more intuitive discoveries—the visceral undertones of a droning electric guitar; the visual, aural and temporal hallucinations induced by mindbending drugs; the mantras and mandalas of Eastern religions—have been assimilated by the culture at large and transformed into the digital pyrotechnics of Magic Eye calendars, “rave” culture techno-psychedelia, mesmerizing TV graphics and high-definition video games. 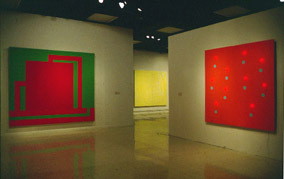 In contrast to Color-field painting’s adherence to rigid formalism, Minimalism’s dismissal of metaphor, and Op’s “shalt not” attitude towards imagery, the artists in post-hypnotic infuse their eye-popping abstractions with provocative and often questioning references to this highly charged visual landscape. post-hypnotic begins chronologically with works from the mid-1980s: Big Iris, Philip Taaffe’s linoprint collage on canvas, recasts the retinal overdrive of Bridget Riley’s classic Op with the intimacy of vernacular design and craft. Scorching Day-Glo color and cell-and-conduit imagery in Peter Halley’s Red Cell convey electronic interconnectivity and the structural systems that shape our contemporary environment. Ross Bleckner’s soft-focus stripe painting, Brothers’ Swords vibrates between ornament and abstraction. Walter Robinson’s scintillating spin-art reframes New York School abstraction in the guise of boardwalk art. A dual concern for modernist abstraction and far-reaching popular reference continues in works included from the late eighties to the present. Paintings that may appear at first glance to be nothing more than patterned stripes, concentric circles or spirals are actually grounded in the real world: Sarah Morris hard-edge grids flip-flop between skewed Mondrians and perspectival views of glass-and-steel architecture. The undulating stripes in Karin Davie’s Lover reincarnate heroic abstraction as a wavy funhouse mirror image, making sly reference to female anatomy. Embedded in clear resin like insects in amber, Fred Tomaselli’s intricately arranged pills and hemp leaves allude to art’s transportive potential. Other artists test our ambivalent fascination with the computer, employing it either as a design tool or for direct output: Aaron Parazette bases his vortex paintings on “clip-art” paint drips which are scanned onto computer to orchestrate color interactions. David Szafranski’s computer-generated Bra Sale rewards patient viewers with a perversely banal “magic eye” message. Op's burgeoning and diverse presence in works by emerging artists suggests that it is, as Tom Moody has written, “an unfinished project.” What was seen in the eighties as a critique of a failed movement is now viewed as more openly experiential. Investigating what Tomaselli has called “the mechanics of seduction,” the work in post-hypnotic tests the blurry boundaries between transient sensory titillation and the transforming experience of ecstasy.